With an Avery Dennison's FreshMarx® - Monarch Labeling System - you print clear crisp information – identify time/date food prepared and contents of containers. With an Avery Dennison's FreshMarx® - Monarch Labeling System - you print clear crisp information – identify time/date food prepared and contents of containers. Labels are easy to read–reduces food waste increases efficiency and food safety. DURAX® Label with its water and tear resistane properties should be your first choice. 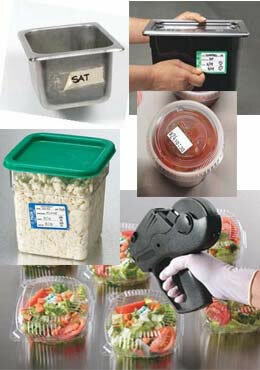 DURAX® Labels work well in warm & cold temperatures and will remain on your containers. REMOVX® Labels stick securely to containers yet are easily removed with minimal or no residue adhesive.